This entry was posted in Architectural History, Cavan, Heritage at Risk and tagged Architectural History, County Cavan, Heritage at Risk, Kingscourt. So glad you brought this up , this is so sad , although they are as much the victims of the changing social habits as the recession . Do you think a fund should be set up to buy some of the best of these and simply preserve and lock them up with the interiors untouched for another and perhaps more enlightened day , . Hate looking at it anymore. I used to collect glasses in it during the busy days and work in it during the Fair of Muff. The most embarrassing thing about it is seeing tourists (mostly Americans) coming up from Cabra Castle and walk by it with their cameras and then not take a photo. Expecting to see a nice building that does be on photos and postcards to the disgrace it is now. Kingscourt needs Gartlans back up and running and looking good so it can attract some interest to the town. Breaks my heart every time we walk past it… Incredible how quickly it fell into disrepair. Only 3 years ago it was still operating. I think some responsibility falls to the owner who received a grant to restore the thatching but was a bit too fond of his own merchandise! A terrible shame. I see it is rated as being of national importance in the recently published architectural inventory of the county. Also featured in the recent Irish film The Irish Pub. Thank you for your contribution. I had not realised this pub was rated of national importance, but one wonders at the value of such ratings when the building is permitted to slide into ruin without intervention. Thank you for getting in touch. There are grants for repairing thatch, of which the owner could avail is so inclined. It is a great pity that both the local community and the local authority seem equally indifferent to the fate of what was once the most photographed building in the area: a short-sighted error that has repercussions, not least economic since there is now less likelihood of passing visitors/tourists troubling to stop and spend money. It is often only once these places have gone that their value is appreciated, an all-too common circumstance in Ireland. happily, the same is now under restoration! 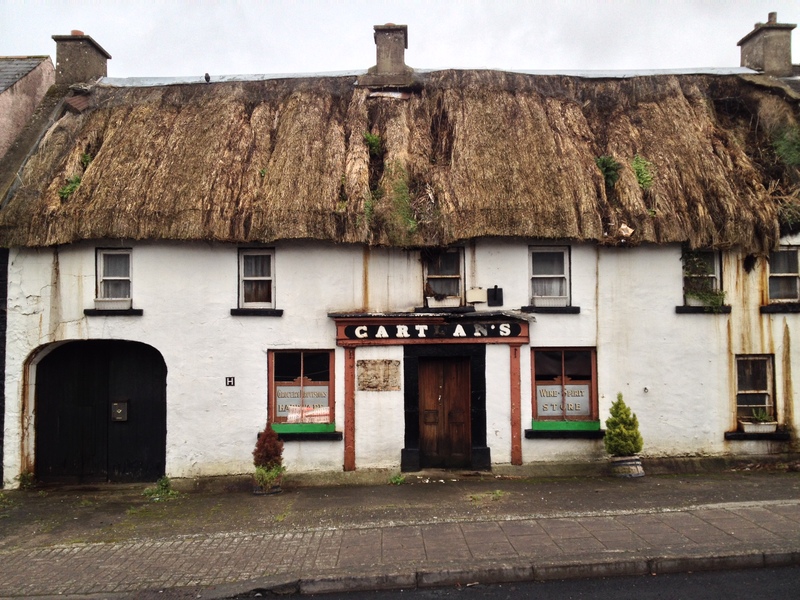 is it true that it was never actually thatched at the back? Thank you for your comment. Yes, I see that the building has recently changed hands and is due to undergo renovation; let’s hope this leads to a bright future.